The Department of Education implements today its national Fun Run project to celebrate the 150th birthday of Dr. Jose Rizal, the national hero who died for his country Philippines after writing two novels: "Noli Me Tangere" and "El Filibusterismo" which incited the Katipuneros to revolts against the Spanish government. This DepEd Fun run aims to invite more participants to donate educational materials or volunteer time for education-related activities to benefit public schools nationwide especially the schools have already open. In a press release, Education Secretary Armin Luistro said that instead of participants paying registration fee, they are requested to bring donations or sign a pledge form stating what they can contribute to upgrade the standard of education in public schools. Donations-in-kind could be school supplies (pencils, ball pens, ruled paper, notebooks, crayons, chalk, etc. ); classroom furniture (chairs, tables, cabinets, etc. ); equipment (fax machine, computers, printers, electric fans, etc. ); classrooms; or shop equipment (for Industrial Arts, Home Economics, Agri-Fishing, etc.). Volunteer man-days / labor support could be serving as a resource person for a particular subject; tutorial assistance; peer counseling; assistance to teachers (preparing visual aids, teacher aid); school maintenance and repairs; or teaching. Luistro expects to bring together education stakeholders in a spirit of fun and love for education. “This is a good physical exertion and at the same time an expression of compassion for our young learners who need our full support,” he explained. However, on their part, the teachers, parents, school children, and stakeholders of the cluster schools of Cubay, Ferlou and Salamanca in the Division of La Carlota took off together in a separate venue of starting place at 7:00 in the morning and converged at the school campus of Ferlou Elementary School for a short program and tree planting activity. La Carlota Division OIC, assistant Schools Division superintendent Ferdinand S. Sy monitored the program while it was about to begin. He took pictures and proceeded to La Granja Elementary School. ALS supervisor Avelino N. Santillan was the invited guest speaker. He talked on the value of education among out-of-school youth and curriculum offerings of Alternative Learning System. The three participating schools were represented by their principals like Mrs. Lenny Nillos of Ferlou ES, Mr. Leynold Sansaet of Salamanca ES, and Mr. Gilbor I. Camporazo of Cubay ES. A stakeholder was represented by PA Capt. Vincent De los Santos, Jr. of La Granja, who turned over a set of school supplies to Ferlou ES as a part of his pledge for the school. As the closing speaker Mr. Camporazo presented the three guiding principles behind a race. He shared his thoughts anchored on Fun Run's theme: "Every Runner, a Finisher. Every Finisher, a Winner." The first principle is "to finish the race." A story is told about a certain runner who competed in an olympic game. While running, his pair of shoes broke. He ran barefooted. He persisted on running. Alas, he came last. To his surprise, most of the media rushed to him and asked him why he persevered to reach the finishing line while suffering from wounds, bruises while running barefooted in which he ought to give up for he will only come last. He simply answered them: "I come here to represent my country and to finish the race." The second principle is an attitude towards the race. President Thomas S. Monson of The Church of Jesus Christ of Latter-day Saints has written about true marks of a finisher (Finishers Wanted). One of these marks is the mark of faith - faith in the Lord Jesus Christ which is the best preparation to finish the race or whatever competition a person may join or participate. As long as he has the strong faith, chances are he could make it. He has the determination to finish it. The third or last principle is the value of race. What we must be proud of?. As what Noel Cabangon's own song composition, "Isa Ako'y Mabuting Pilipino... Inaalagaan ko ang ating kapaligiran... Ipinagtatanggol ko ang aking karangalan... Iginagalang ko ang aking kapwa tao Ipinaglalaban ko dangal ng bayan ko... Pagkat ako’y isang mabuting Pilipino..."
We ought to be proud of our race - a Filipino race. Mabuhay ang Pilipino. Mabuhay tayo! Long live the Philippines! Tree planting activity ensued after the program at the garden area of Ferlou Elem. School. Then a hearty snacks were served at the office of the school principal. Oh I wonder if Rizal will be happy at the state of education in the Philippines today. Even the most basic need for classrooms has not even been properly addressed. You're absolutely correct! The DepEd ever since has kept an updated inventory of schools which are inadequate in classrooms, but yet priorities were of those who were these best of friends. There are NGOs which are building school classrooms for promoting their agency or an agenda behind just to get a favor from the DepEd on their future business venture with said education agency. Lucky are those schools which are in dire needs of additional classrooms, have been given a project of school building construction. Everybody is indeed a winner in runs from the runners to the beneficiaries of the run. Everybody is indeed a winner in runs from each participants, each finishers until the beneficiaries of the run. This is a nice project made by Dep-Ed, I hope many running enthusiast will participate so that many public school will benefit from this. I hope they will also organize this here in Davao so I can participate too. 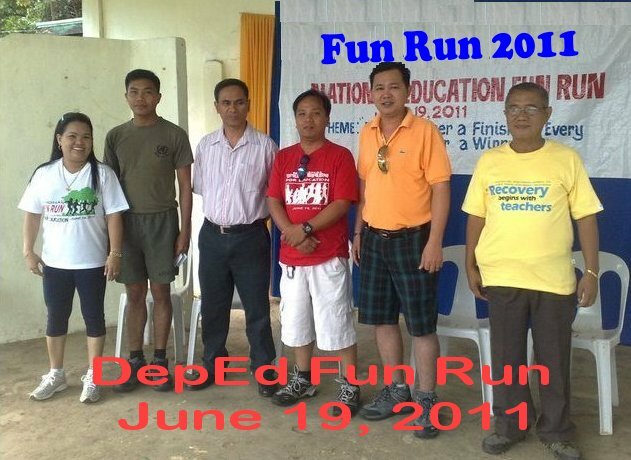 Wow it's a v nice project of Deped fun run for Rizal's birthday. I really miss the fun run!